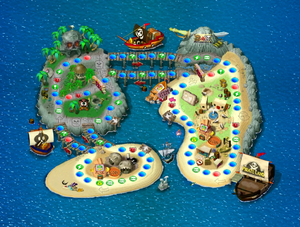 Pirate Land is an archipelago in Mario Land in Mario Party 2. Players are dressed in pirate garb, and have the title "Captain" in their names. There are Thwomps on the board that block shortcuts and request a toll. If the player wants to take the shortcut, they have to pay the Thwomp's fee. The fee starts at 1 coin, and escalates by one coin each time the fee is paid (this is similar to the Thwomps from the level in Mario Party 2's predecessor, Mario Party's Yoshi's Tropical Island). Also, if players land on a Blue Space that's on a dock, Sushi the shark will come and take them to another dock (they will still get the three coins). Anyone who lands on Happening Spaces makes the Pirate Guys ship fire cannonballs at the players blasting everyone standing on the corresponding bridges back to start. The Item Minigame is Roll Out the Barrels, and the Duel Minigame is Saber Swipes. In the item minigame, CPU's seem to go after Baby Bowser half of the time. At the end of the game, a red Koopa Troopa comes and alerts the players that the treasure has been found. A cut-scene then shows a green Koopa in a cave where the treasure is. Suddenly, the board villain, Cap'n Bowser, comes to take the treasure for his own. However, before he does, the winner of the game comes to confront him. The two engage with a sword fight, with the winner poking him in the stomach. Bowser bellows, "That smarts!" and leaves, leaving the treasure to the winner, who is congratulated by the other players, Toad, Koopa, and the Star. This page was last edited on June 28, 2018, at 17:13.